Sweet and creamy strawberry flavored milk. Concentrated flavour has to be mixed in a PG/VG Base of your choice. Advised Dosage : 25% Maturation : 5 - 15 days ..
Rich custard with a splash of vanilla Concentrated flavour has to be mixed in a PG/VG Base of your choice. Advised Dosage : 25% Maturation : 5 - 15 days ..
Caramelized apples in a spiced cinnamon bath, folded into a perfect flaky pastry crust Concentrated flavour has to be mixed in a PG/VG Base of your choice. Advised Dosage : 25% Maturation : 5 - 15 days .. Perfect combination of a delicious vanilla ice cream and a chocolate biscuit. Concentrated flavour has to be mixed in a PG/VG Base of your choice. Advised Dosage : 25% Maturation : 5 - 15 days ..
A chocolate chip cookie dipped in a glass of milk Concentrated flavour has to be mixed in a PG/VG Base of your choice. Advised Dosage : 25% Maturation : 5 - 15 days ..
Sweet aromatic cinnamon baked into rich buttery rolls, drizzled with a velvety smooth frosting. The perfect vape to wake up to in the morning. Concentrated flavour has to be mixed in a PG/VG Base of your choice. Advised Dosage : 25% Maturation : 5 - 15 days ..
Sweet and creamy vanilla milkshake flavour. Concentrated flavour has to be mixed in a PG/VG Base of your choice. Maturation : 5 - 15 days ..
Toasted rice cereal stirred into a bowl of melted marshmallows Concentrated flavour has to be mixed in a PG/VG Base of your choice. Advised Dosage : 25% Maturation : 5 - 15 days ..
Sweet and refreshing mint flavour. Concentrated flavour has to be mixed in a PG/VG Base of your choice. Maturation : 5 - 15 days .. Strawberry Dipped in Melted White Chocolate. Concentrated flavour has to be mixed in a PG/VG Base of your choice. Advised Dosage : 25% Maturation : 5 - 15 days ..
Apple, Berries, Pear, Tropical Fruits, Cream Concentrated flavour has to be mixed in a PG/VG Base of your choice. Advised Dosage : 25% Maturation : 5 - 15 days ..
Koolada will help you give your mixes a real fresh taste and a frozen exhale. Concentrated flavour has to be mixed in a PG/VG Base of your choice. Advised Dosage : 20% Maturation : 5 - 15 days ..
Blueberry Custard Concentrated flavour has to be mixed in a PG/VG Base of your choice. Advised Dosage : 25% Maturation : 5 - 15 days ..
Anis and Menthol Concentrated flavour has to be mixed in a PG/VG Base of your choice. Advised Dosage : 20% Maturation : 5 - 15 days ..
A succulent harmony of red fruits and melon cream Concentrated flavour has to be mixed in a PG/VG Base of your choice. Advised Dosage : 25% Maturation : 5 - 15 days ..
A fruity undertone and a cool crystal after sensation that will leave you wondering what it is... and wanting more. Concentrated flavour has to be mixed in a PG/VG Base of your choice. Advised Dosage : 20% Maturation : 5 - 15 days ..
Sweet & creamy a perfect milky blend Concentrated flavour has to be mixed in a PG/VG Base of your choice. Advised Dosage : 20% Maturation : 5 - 15 days .. Strawberry and kiwi. Concentrated flavour has to be mixed in a PG/VG Base of your choice. Advised Concentrate dosage: With a base 50/50 of PG / VG: 15% With a base 30/70 of PG / VG: 17% With a Full VG base: 20% Recommended steeping time: 5-15 days. ..
100% chewing gum Intense flavor that will transport you instantly to your childhood. Concentrated flavour has to be mixed in a PG/VG Base of your choice. Advised Concentrate dosage: 20% Recommended steeping time: 5-15 days. ..
A subtle sweet honey with strawberry undertones. Concentrated flavour has to be mixed in a PG/VG Base of your choice. Advised Dosage : 15% - 20% Maturation : 5-15 days .. The Killer Kustard Strawberry, sublime the famous Killer Kustard, a creamy Vanilla Custard with notes of ripe Strawberries for a succesful marriage. Concentrated Vapetasia has to be mixed in a PG/VG Base of your choice. Advised Dosage : 15% - 20% Maturation : 5-15 days The Killer K..
A quality ice cream wrapped in a cereal dough, a crunchy and tasty crust: a mystery. A vanilla ice cream coated with a caramelized cracker, a perfect rendering! Concentrated aroma has to be mixed in a PG/VG Base of your choice. Advised Dosage : 15% - 25% Maturation : 5-15 days ..
Cookie stuffed with chocolate and cream. Concentrated aroma has to be mixed in a PG/VG Base of your choice. Advised Dosage : 15% - 25% Maturation : 5-15 days .. The full power of ripe blackberries will allow you to enjoy a great fruity flavor in this powerful mix. Concentrated aroma has to be mixed in a PG/VG Base of your choice. 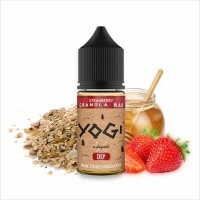 Advised Dosage : 5%-10% Maturation : 5-15 days ..
Creamy stracciatella strawberry mousse Concentrated aroma has to be mixed in a PG/VG Base of your choice. Advised Dosage : 5%-10% Maturation : 5-15 days ..